When you are setting goals related to your career or business, should you have a Plan B? There are successful people who argue that you absolutely should not. In my coaching business, I also meet clients who are paralyzed with anxiety unless they have a Plan B. 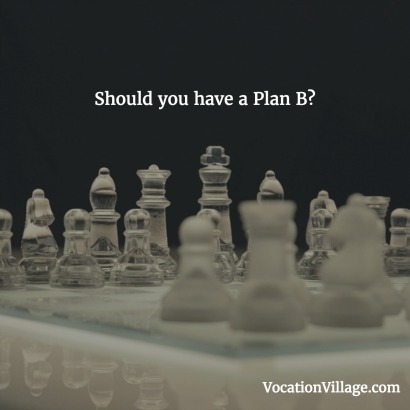 Plan B is what enables them to have sufficient centeredness to proceed with Plan A. How do we reconcile such contradictory advice? For people in creative professions, I suspect that the high level of challenge in achieving success means that only the most driven and committed will succeed, so those with an alluring Plan B are highly likely to abandon Plan A. To circumvent this, use a psychological technique called stress inoculation. Stress inoculation aims to increase psychological resilience against stressors. Like inoculation in the medical sense, the idea is to deal with exposure to stress in a controlled and measured way to learn adaptive strategies for dealing with the situation in the future. In creative careers, for instance, we can anticipate that there will be a high level of rejection. A person embarking on a creative career should expect this and prepare in advance for how they will react. They should imagine the rejection, plan a response, and line up support before the actual rejection occurs. This way, a premature flight to Plan B is less likely. For both creative careers and for less challenging careers where the odds of succeeding are higher, I am a fan of the approach of viewing career options like attempting to win an Olympic medal. Aim for the gold (Plan A) but after a pre-determined amount of time if you haven’t succeeded, aim for the silver (Plan B). Either way, you win a medal! In business, success is almost never linear and survival depends on the ability to pivot as circumstances change, so for entrepreneurs, a Plan A that is overly rigid will almost certainly ensure failure. But if Plan A is sufficiently broad, for example, “Be the best business services networking company,” then you can commit fully to Plan A and change the strategy to get there as market conditions change and as you acquire more information along the way. Even in a consulting business like mine, where I have as my business objective, “Help people achieve career happiness and success,” the method by which I achieve that has changed dramatically over the years. When I started, my only business method was meeting clients face-to-face in one office location. Now, I work via webcam, telephone, and email. The objective is the same but the process evolved to reflect a changing world. Does that mean I gave up Plan A? No, it just means my Plan A adapted to new market conditions. Even if the market conditions stay the same for you (although they probably won’t), your Plan A also might change because your needs or interests change. That’s why career changes happen. Someone decides they want something different so they reinvent. Create a Plan A, evaluate progress as you go, adapt to changing circumstances, evolve Plan A or migrate to Plan B, repeat. If this article was helpful to you, please share it. (2) Forget About Plan B?